We are a beef farm and have converted some redundant stone courtyard barns into four fantastic oak beamed cottages with modern facilities throughout, all finished to an exceptional standard. For hire with self catering accommodation for larger groups comprising bar, seating for 30, wood burner, sound system and room to party the night away. We also have caterers available if required. Accommodates 7 adults & 1 baby in 3 bedrooms, with family bathroom and open plan lounge/diner. Separate kitchen downstairs with patio to the front of the cottage. Accommodates 7 adults + 1 baby in 3 bedrooms – 1 double ensuite, here 1 triple (double & single) and 1 twin with family bathroom and large open plan lounge kitchen diner with patio to the front of the cottage. A private luxury hot tub is now available for Tiarks cottage in its own custom renovated building! Can also be rented by groups. Accommodates 7 adults & 1 baby in 2 bedrooms (1 double, 1 triple & 1 double sofa bed in the lounge). This cottage has the benefit of being on one level and is therefore suitable for the elderly/less mobile, & has its own private patio to the rear of the cottage. A private luxury hot tub is now available for this cottage in its own custom renovated building! Accommodates 4 adults & 1 baby in 2 bedrooms (1 double bed & 2 single) with family bathroom and open plan lounge/kitchen/diner downstairs with patio to the front of the cottage. Play a relaxing game of snooker in our spacious and comfortable snooker room and unwind after a busy day. Stay on a working farm in luxury! As a family farm there is opportunity to see the animals and experience at close hand 'life on the farm'. We are very keen on the environment and have planted 10,000 trees into a woodland, replanted an apple orchard and are involved in a number of schemes promoting good environmental practice, including a reed bed. We regularly arrange for the rental of our entire accommodation - we can accommodate from 1 to 30 and also have complimentary high chairs, travel cots, full sized cots and bed linen available. These range from your own personal Chef, golf day passes and packages, through to clay pigeon shooting, wine tasting, outdoor pursuits, cakes, beautician, cocktail making, hairdresser & horse riding lessons to name but a few. Please contact us to tells us what you'd like us to arrange for you! Nestled below Crooks Peak on the edge of the Somerset Mendips Hills and amidst Somerset's famous cider making and Cheddar strawberry growing area, the cottages form an 'L' shaped courtyard which is next to an Area of Outstanding Natural Beauty. 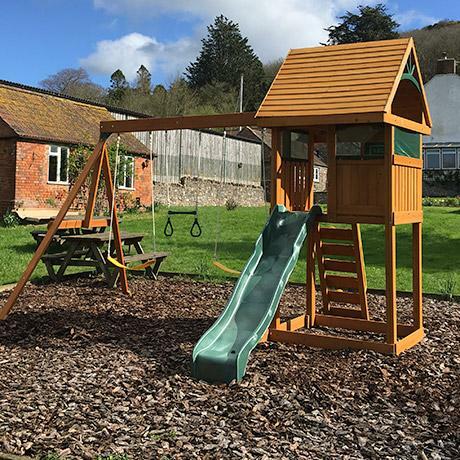 The 4 cottages (which can be hired individually or together for larger groups, accommodating 1-30) are an ideal base for visits to many nearby attractions including Cheddar Gorge, Wookey Hole, historic Wells & Glastonbury, Longleat Safari Park, Weston-super-Mare, Brean and the cities of Bristol and Bath. 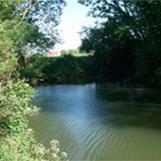 We also have our own river frontage on the River Axe for private fishing! Let the kids burn off some energy in the play area. Had fantastic time. all cottages lovely & well equipped. Use of Party Barn & hot tub a bonus. Hosts were great, very friendly, welcoming & accommodating. Clean, modern & in a beautiful area - Cannot fault it! Julie/Mark are great hosts. Cottages are fantastic with all mod cons & on the doorstep of the coast. We couldn't have had a better time. Held my 40th Birthday celebrations at Webbington Farm & it was absolutely everything I had hoped for. Accommodation is perfect, great for a large. Party Barn is charming & was very warm & welcoming. Julie/Mark were great & went the extra mile to help out my friends! Thank you. Highly recommended! Wonderful time had at Webbington Farm for my 40th Birthday in February! Hired all accommodation - Cottages are beautifully decked out & Party Barn & hot tub were an amazing bonus. Julie/Mark were excellent hosts throughout our stay. Julie couldn't have been more helpful or responsive during the booking process. Highly recommended! What a wonderful week! Absolutely recommended. Julie/Mark were the perfect hosts. We stayed in Kitty & had everything we could ask for. The cottage was stylish & well equipped. Mark took us on a visit to a neighbouring dairy farm - Great location for day trips & walks. So close to Cheddar Gorge. Lots of local cider farms & farm shops. we just loved it!! The hot tub was a bonus. Absolutely recommended! Absolutely incredible place! Done to the highest standards - this place is nigh on perfection! We stayed in Tiarks. Cottage is immaculate with large private courtyard & indoor hot tub. Also has a Party Barn to hire if you so wish. Wifi included. Close to Puxton Park if you have kids & Weston-super-Mare. Large supermarkets nearby. Owners were very welcoming & delightful & went above & beyond. Complimentary welcome pack. Everything is already here.